Are you jonesin’ for the beach right now?? It has been a brutal winter and a disgustingly cold March…seriously, 5 inches of snow a few days ago in Louisville! 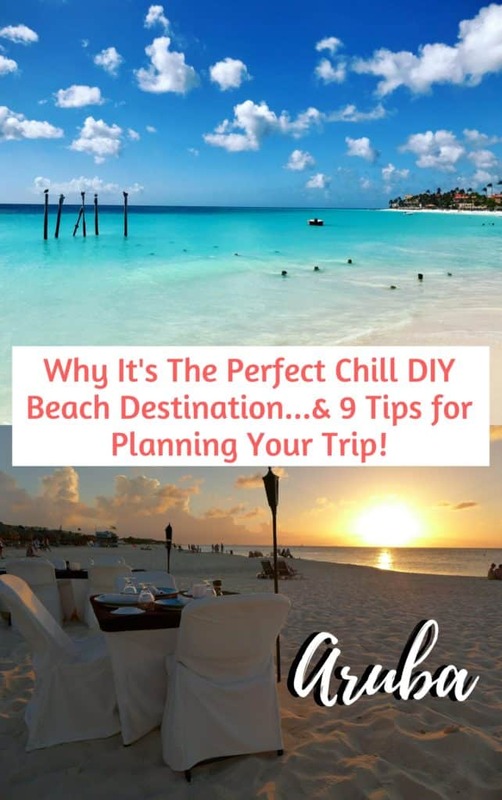 So if you’re in the market for a chill beach vacay that’s a little more on the DIY side—not the expense and pomp of an all-inclusive resort—then I have the perfect place for you! 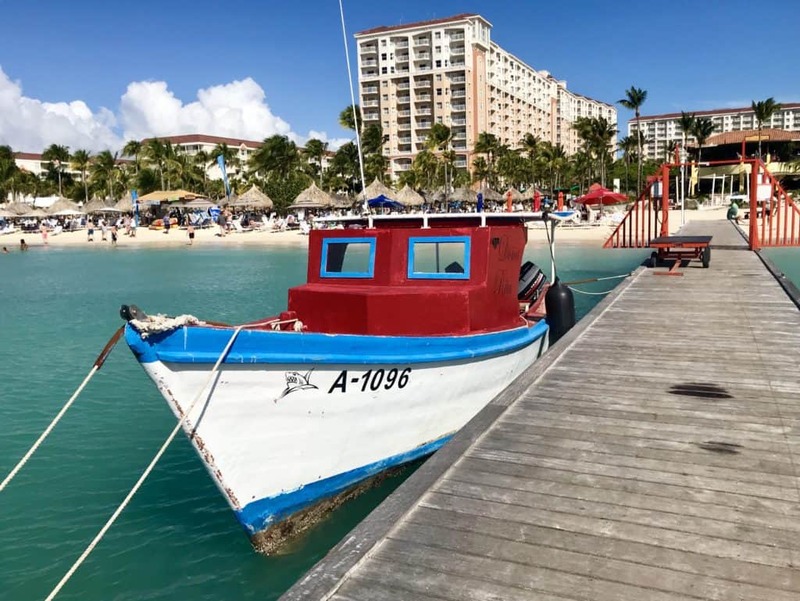 While many of the most popular places in the Caribbean are dominated by all-inclusives and in some case it’s not safe (or just not pleasant) to leave the resort, Aruba is the perfect island for a DIY beach vacation. It’s compact, relatively safe, and has multiple types of housing and transportation options for different budgets. 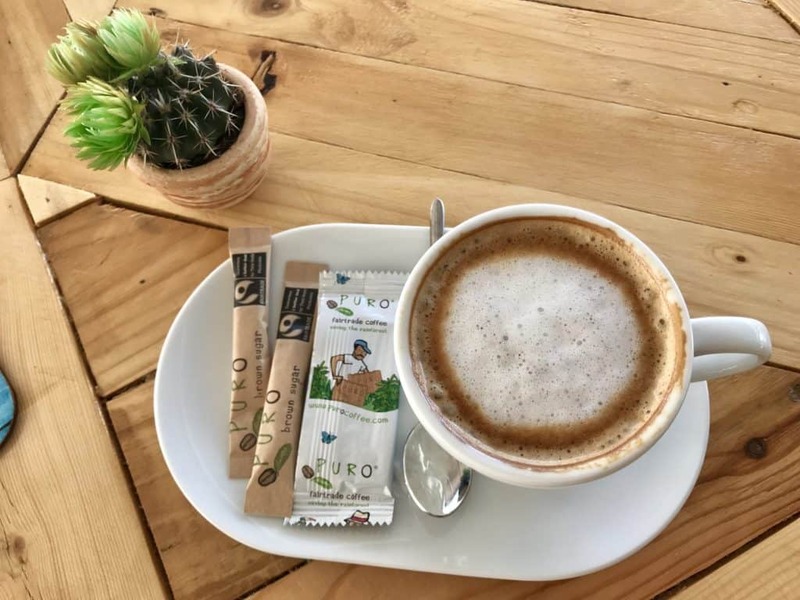 People are friendly, many people speak English, the dollar is widely accepted (you may get change in Aruban florins or a mixture), and it’s outside the hurricane belt. 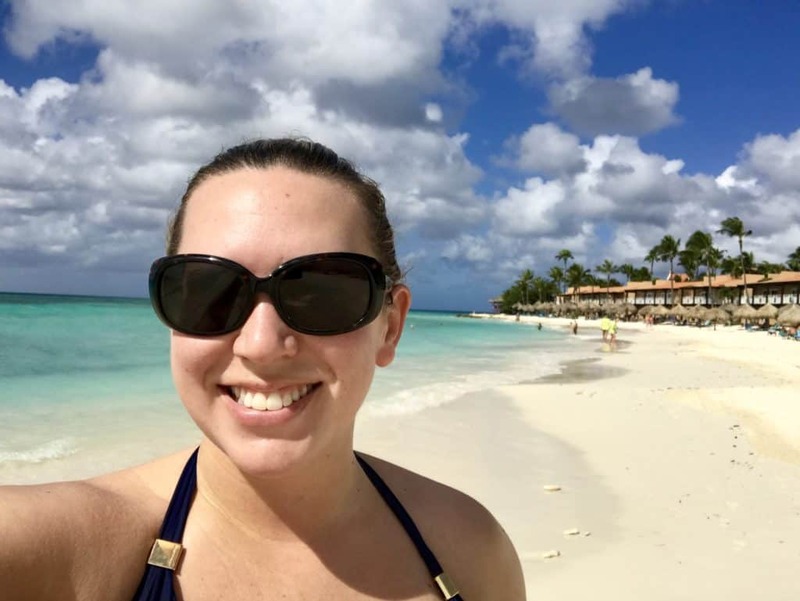 After a couple of solo trips to this beautiful island, here are my best tips for what to do in Aruba—whether you’re a solo traveler like I was, or on a romantic getaway or a family trip. 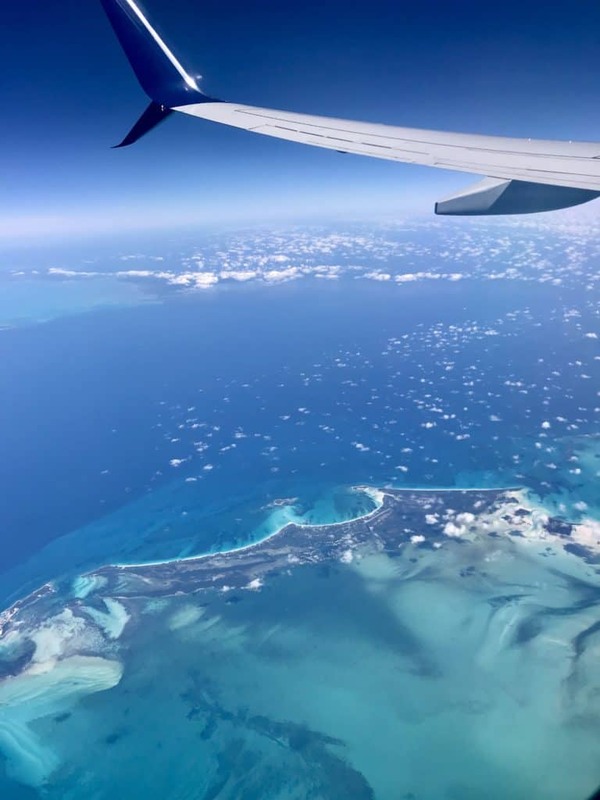 I totally lucked out on a window seat and great time of day this time, and got to see this gorgeous view from the plane…I think this is some part of the Bahamas. Isn’t it pretty?! 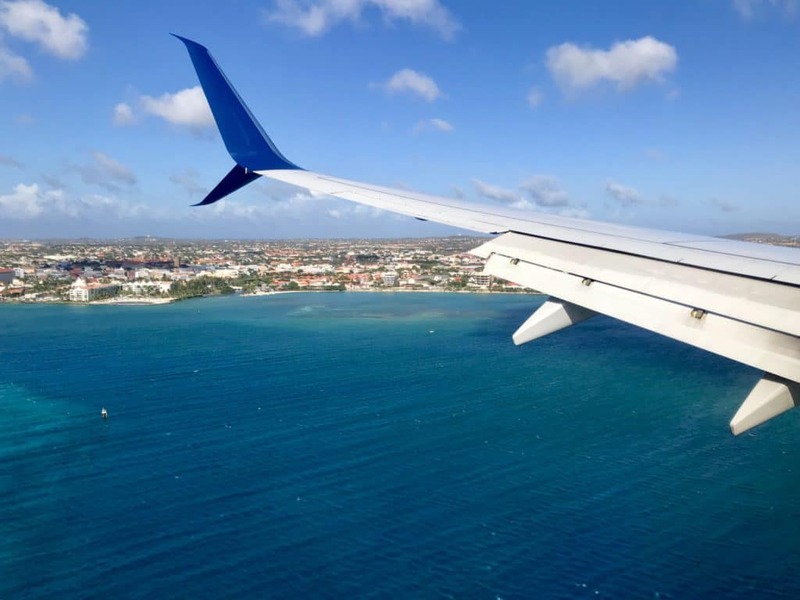 Descending into Aruba…you go parallel with all the main beaches. There isn’t a *wrong* choice, per se. But it also means picking where you want to spend the majority of your time, including which BEACH you will live at (see #2). Transportation plays a big role here You’ll want to decide whether you’re going to rent a car (or jeep) or just use walking, biking, taxi, and/or the bus. I accidentally opted for the latter on my most recent trip because I didn’t get my crap together in time and it was the few days leading up to Christmas so there weren’t cars available. If you do end up renting a car, then where you’re staying isn’t quite as critical, but can definitely play a role in cost. 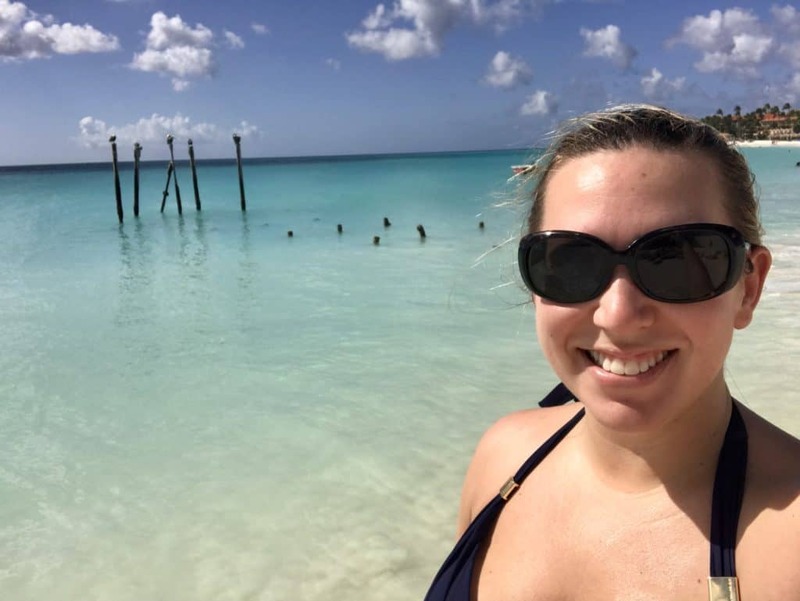 The first time I was in Aruba I ended up in the Noord area, but this time I opted for Rik and Karen’s Airbnb apartment just north of Oranjestad. It’s just a 5-minute walk from Druif Beach, which ended up being the ideal place for me to base myself. Rik picked me up at the airport and then I happened to arrive around happy hour, so I walked over to a restaurant with them and some friends for some Balashi beers and conversation. It was a wonderful Aruban welcome! 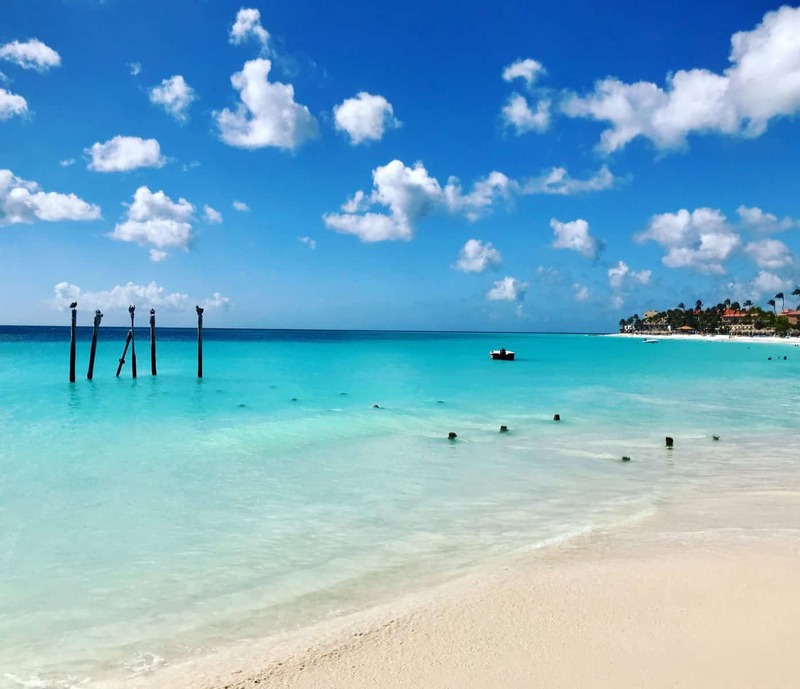 Unlike many Caribbean islands, Aruba isn’t focused on big all-inclusive resorts. 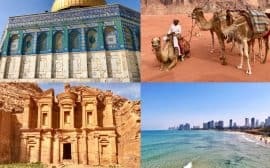 There are a few of them, certainly, but there are also tons of regular resorts, big hotels, cute boutique hotels, and tons of Airbnb rentals. 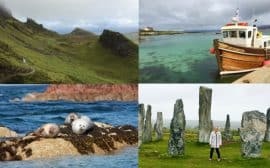 I’ve always gone the Airbnb route here, though have been tempted by a few of the boutique hotels and also by a couple of the resorts. Hotels here are pretty expensive in my opinion though. Every morning I walked from my little Airbnb to Druif Beach, by way of this new little restaurant called Alfresco. I sat on the patio and looked across the highway at the ocean while I had my coffee and peanut butter oatmeal smoothie, then walked across the road to the beach. If you’re looking for crowds and energy, Palm Beach is for you. There are tons of hotels lining the beach, so it’s pretty crowded and is popular for watersports. 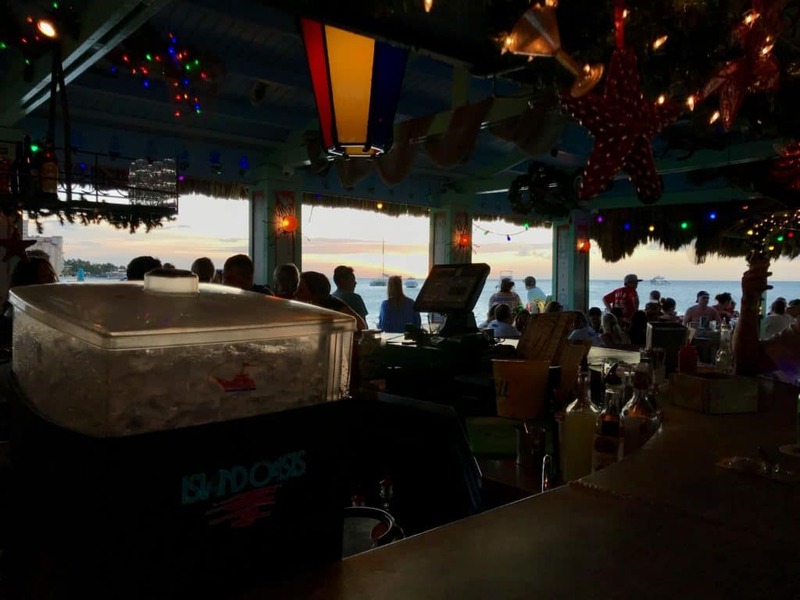 You can also do a happy hour bar crawl along the beach if that’s your style. 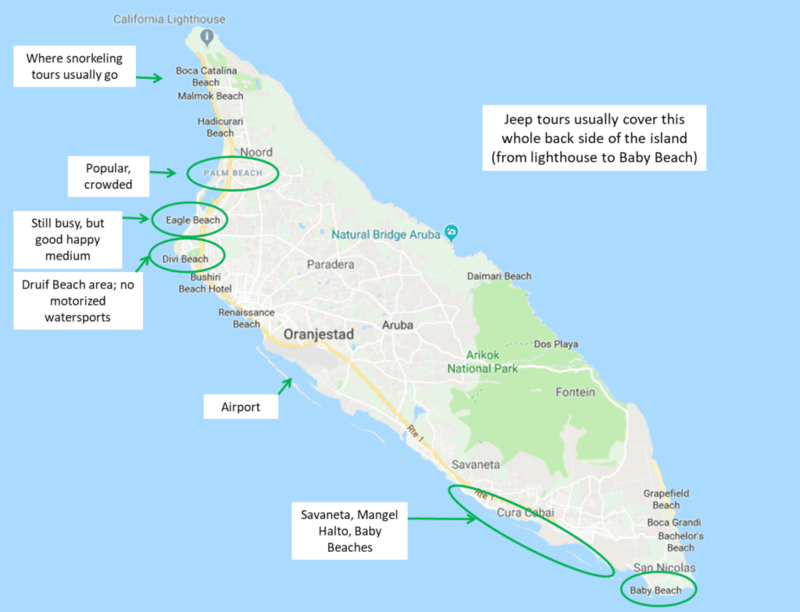 It is definitively NOT for me (too noisy and crowded), but if you take a snorkeling tour or something along those lines, it will likely sail from Palm Beach. Eagle Beach is probably the most iconic tourist beach, the one you’ve seen pics of. It’s the widest beach on the island and also very popular for watersports (and a popular “restaurant on the beach” spot). This is where I spent my time on my first trip, and it’s nice but still pretty busy. There are drink and food vendors to keep you sated. 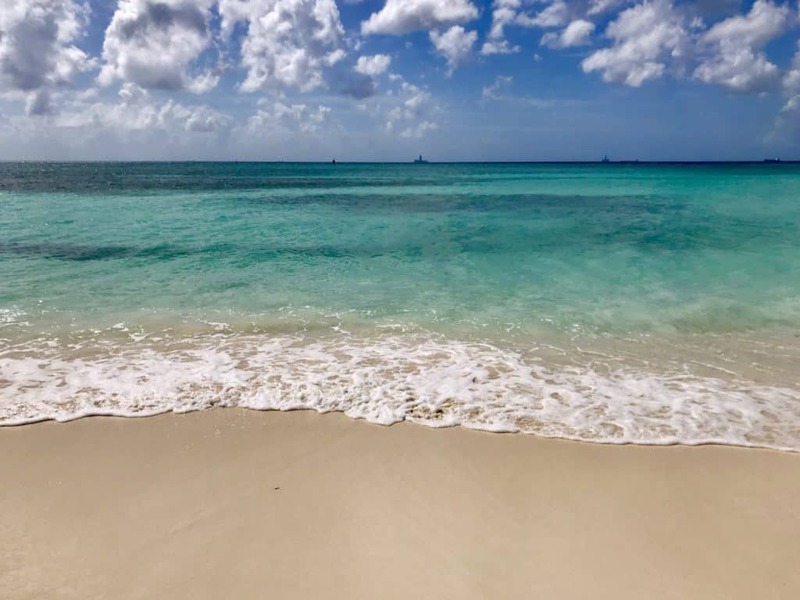 Divi and Druif Beaches (and Manchebo, from what I can tell) are right next to each other, and are an under-the-radar gem. This is where I spent almost all my time on my most recent trip—more about these beaches in a sec. Baby Beach is super out of the way, though with a car it’s not too bad. A visit here is included on most jeep tours and it is a lovely, peaceful spot…but there are oil refinery towers in the back of every photo, which kind of ruins the vibe. Great for a half-day trip though. Mangel Halto is supposed to be amazing, it’s on the south side (down toward Baby Beach) so out of the way but you should have it all to yourself. Savaneta is down that way too. But without a car, these would be a very expensive cab ride. On the opposite end of the island, Boca Catalina and Malmok Beach are on the north, and are supposed to be lovely (and great for watching a sunset). 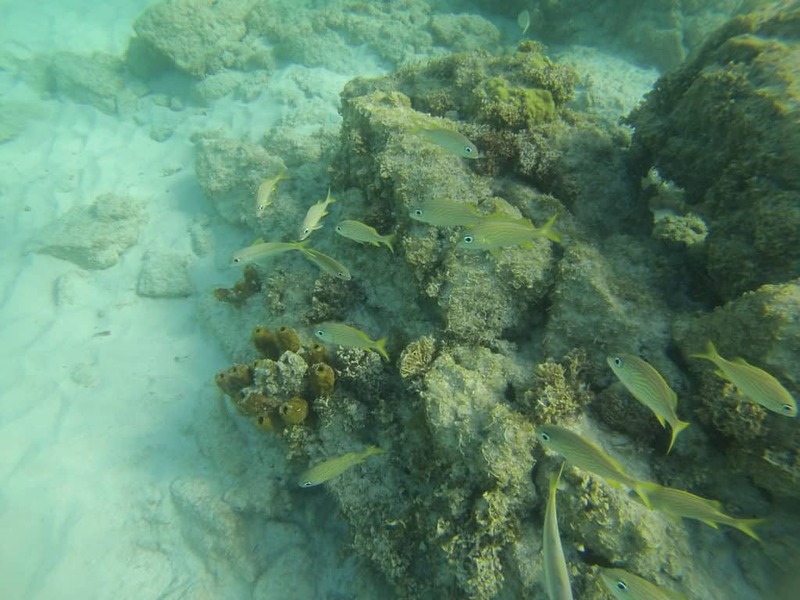 Great swimming and snorkeling (all the snorkeling and sailing tours come up to this area). 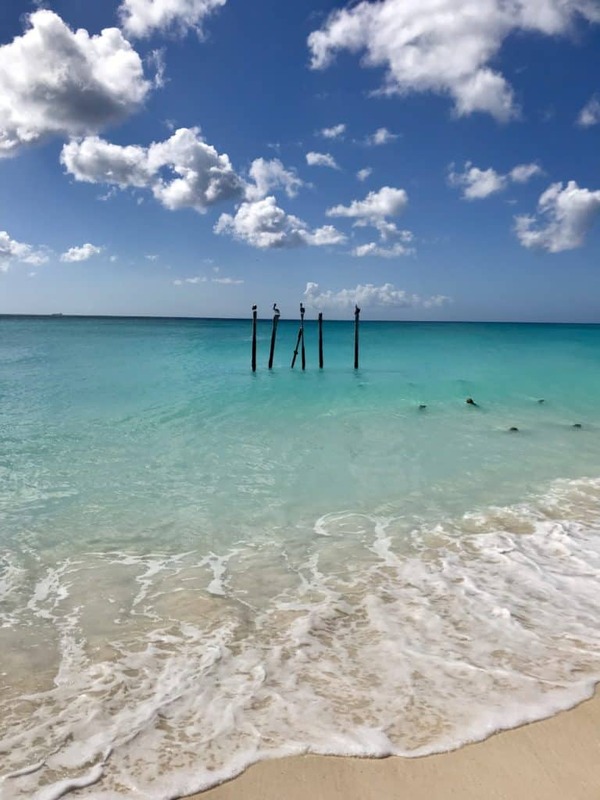 This is the Druif, Divi, and Manchebo Beach areas, home of the famous pelicans on the poles. I totally fell in love with this beach and pretty much parked myself here the entire trip. Why, you ask? It is so CHILL. First, motorized watersports like jet skis aren’t allowed at this beach, so it’s so much quieter than some of the other beaches. Second, look at these pics—where are all the people?? 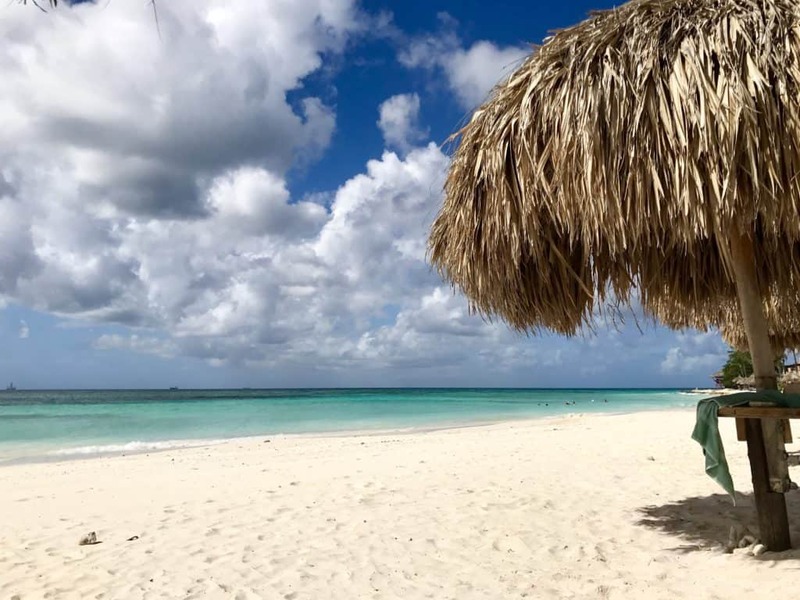 There are a couple small resorts on these beaches, but they seem to draw a much more relaxed crowd and even during peak holiday season the beaches and the palapas weren’t crowded. It often felt like I had the beach to myself. The only downside to basing myself at Druif Beach was that the food and drink options are very limited. 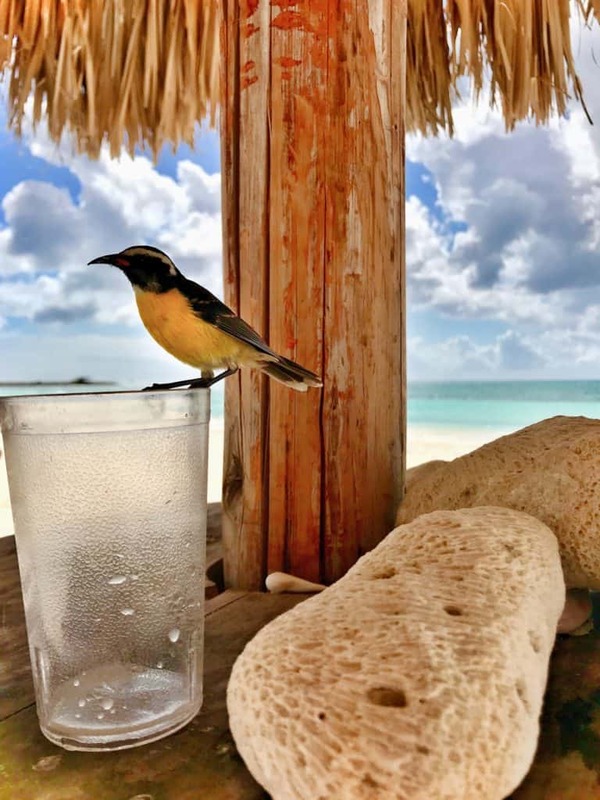 Unlike some of the more touristy beaches, there’s not a bar on every corner, and because the two resorts on the beach are all-inclusive, you can’t just pay your way in. I did find my way into one of the pool areas and there was a bartender who let me buy drinks. They weren’t amazing, but they did the trick. And so I had to go in search of lunch when I wanted it as well. I often made my way back to my morning coffee place, Alfresco, or grabbed pastechis at Don Pastechi Factory; honestly, the heat tends to make me not super hungry. 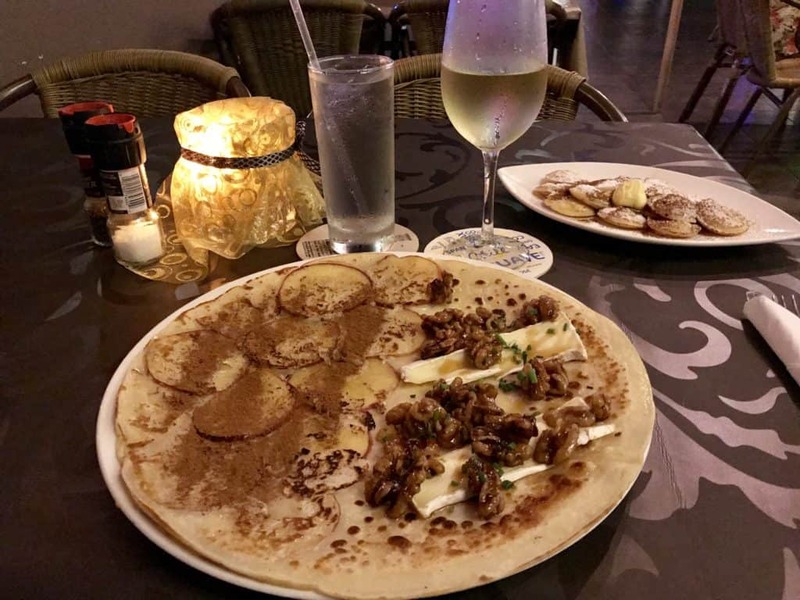 As I’ve mentioned in a previous post, Aruba is quite the melting pot of cultures, and that shows in their traditional foods. I fell in love with pastechi—delicious filling in fried dough (duh, what’s not to love??). I grabbed several from Don Pastechi Factory, which happened to be right on my walk to the beach. Dutch pancakes also get a lot of hype. The ones I had at Dutch Pancake House were just okay, but I’ve heard the ones at Linda’s and Diana’s (two other restaurants) are awesome. Other must-try foods are pan bati, keshi yena (think big ball of cheese stuffed with spicy meat), pan bolo, and acaya. As I’ve said above, Palm Beach isn’t really the best fit for my personality and travel style, but I did make sure to get up there once just for the experience. Well, actually twice, because my snorkeling tour left from there. 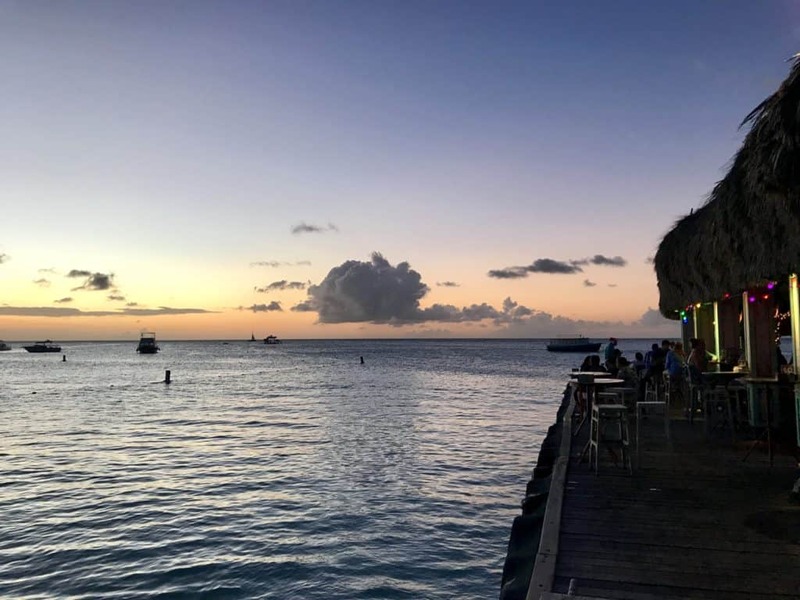 On my second night in Aruba, I biked up to Bugaloe, a popular beach bar, to have a few drinks and watch the sunset. The servers sing karaoke and the patrons are lively and fun, and I’m glad I headed up there (even though I brought my Kindle so I wasn’t exactly chatting people up…). 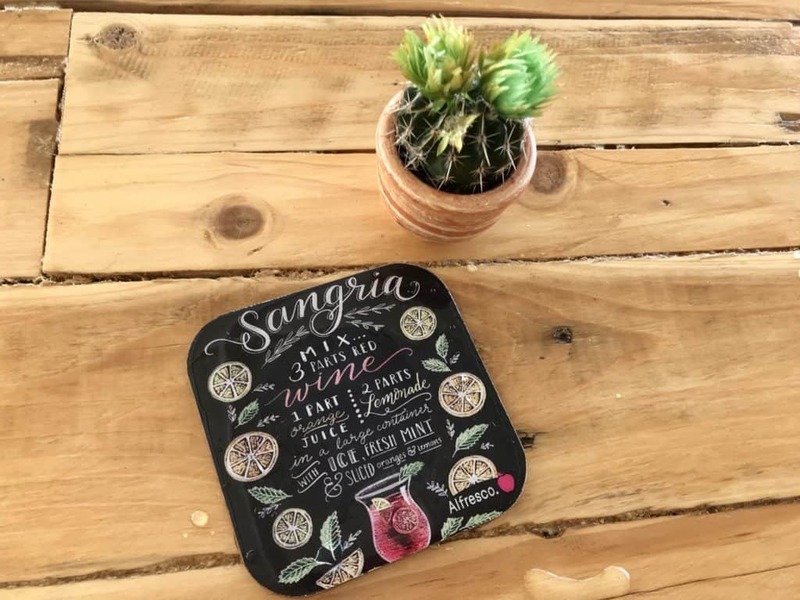 Since I had to be up at the pier to meet my snorkeling and sailing tour at 3pm one day, I headed up around noon (taxi this time…man, I hate bikes) and got to stuff myself full of delicious fruit bowls from Eduardo’s Beach Shack. It is the BOMB. 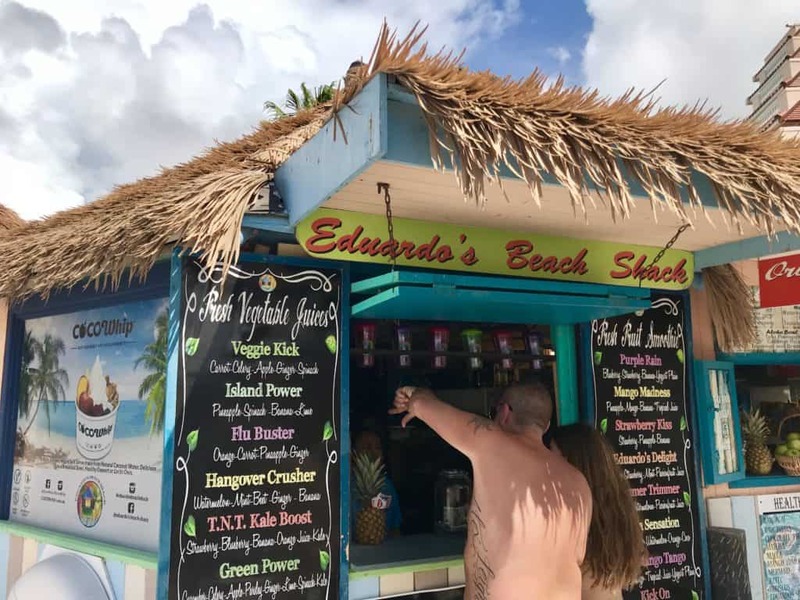 Pro tip: Don’t miss out on an acai bowl from Eduardo’s Beach Shack. Heaven. …which brings us to one of my must-dos. Take a sail and snorkel tour, and I highly recommend The Black Pearl. On my first trip to Aruba many, many moons ago, I ended up catching the Jolly Pirates booze cruise on a whim. It was last-minute and cheap, and I really wanted to get out on the water and watch a sunset out there. It’s way too much of a party vibe (with terrible cheap liquor, to boot) for me, but lots of people really enjoy it. This time I did some research and found a few different chiller sailing or catamaran options. 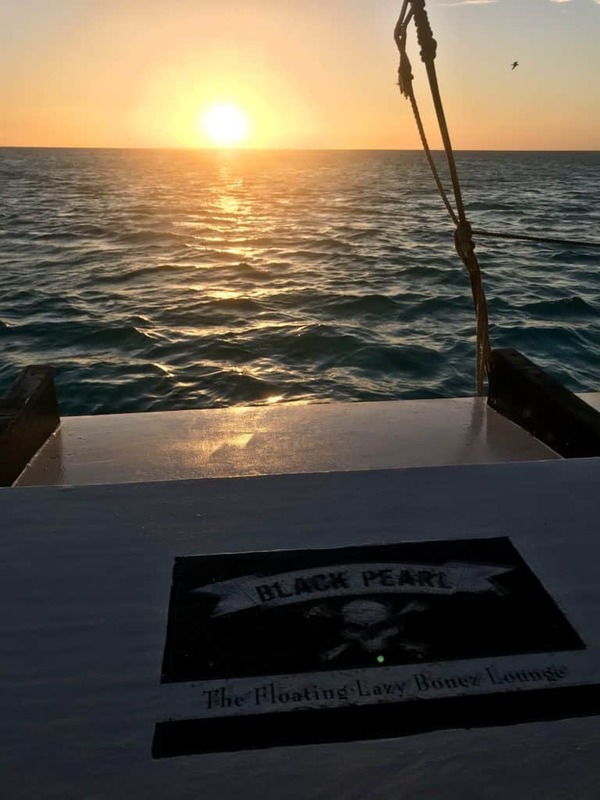 I have a separate post all about my sailing and snorkeling on the Black Pearl here. Despite some rain a bit earlier, it was a beautiful day and so peaceful out on (and under) the water. 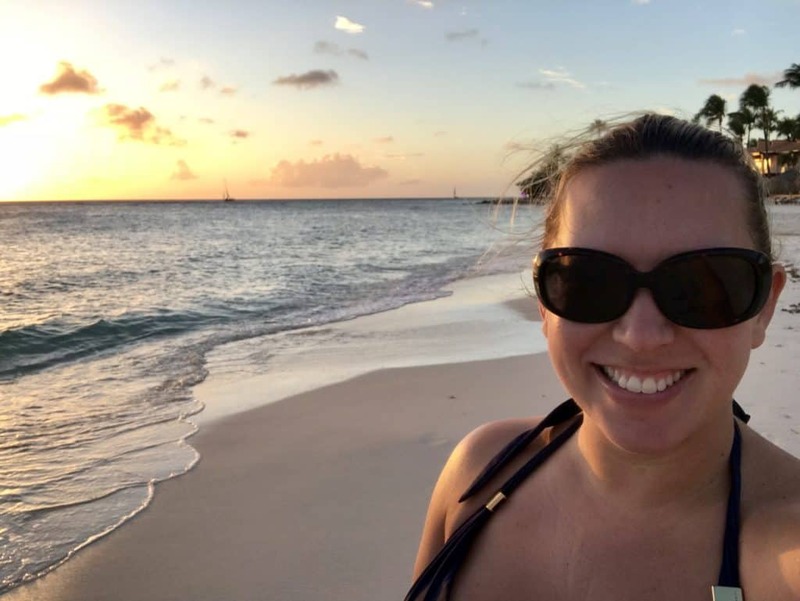 We enjoyed some drinks (without the booze cruise rowdiness) and some toasted cheese sandwiches, and then were graced with a gorgeous Aruban sunset. I actually did this on my first solo trip to Aruba, and thought it was awesome. It was a full-day offroading jeep tour that covered everything from the California lighthouse, the chapel, some of the stunning coasts on the back side of the island, Baby Beach, Natural Bridge, the ostrich farm, the wild donkeys, caves, and more. It’s amazing how much Aruba has, given how small it is. You’ll see large swaths of the island that are inside Arikok National Park and only accessible to an offroading vehicle. 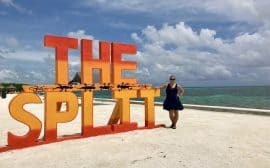 Having a vehicle that can offroad is a must when seeing some parts of the island, so this gave me the opportunity without an expensive rental, and I got to see things I would have missed on a self-guided tour. I’ve done a whole post about the experience here if you’re interested in learning more! #7 – Spend some more time on the beach. Duh. I seriously lived in this one spot on Druif Beach and just chilled. One of the great things about Aruba’s constant wind is that it keeps you cool. 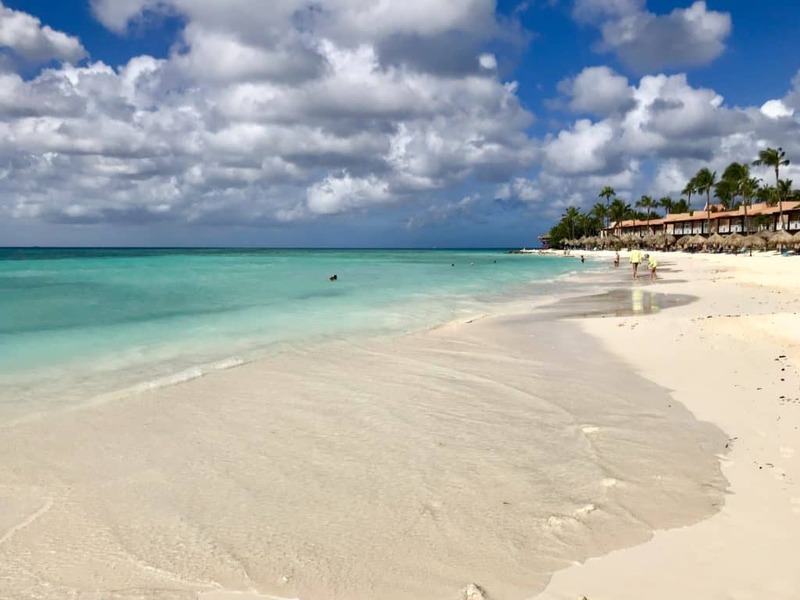 None of that boiling, roasting, dripping sweat that you often get in a tropical destination…Aruba’s climate is more desert-like and it gets constant trade winds that keep you cool. (Also sometimes sandblast/exfoliate you, but that’s a different story…). Have a coconut. Drink some water. Have a cocktail. 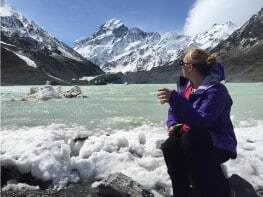 Drink some more water (seriously, that wind dries you out). Listen to some tunes, read your Kindle, maybe go have some lunch, come back and set up shop under your palapa. Congratulate yourself on choosing an awesome beach. This was a little bit of a splurge, but I really wanted to have a meal at one of the restaurants where you eat right on the beach with your toes in the sand. Rik from my Airbnb recommended Passions on the Beach as his favorite of them, so I made myself a reservation for one and headed up there a little early to have a drink at the bar. I got to watch them set up the restaurant on the usually-busy Eagle Beach and sip my (delicious) mojito. The bar at Passions is worth a visit regardless of whether you’re eating there or not…great drinks, attentive bartenders, and a nice view. I kind of assumed that they’d park me somewhere toward the back since I was by myself, but they led me up to the very front row of the tables and the service was great (though they’re definitely stretched thin, so it took a bit to get my first glass of wine). My entree and dessert were delightful, though steer clear of the ceviche. I thoroughly enjoyed the beautiful, peaceful sunset, the tiki torches, and the waves. So after watching the sunset with a hundred of my closest friends at Passions on the Beach, I made sure to spend sunset on my final night right in the same spot I’d been spending my days—on Druif Beach. I literally had the entire beach to myself. Not another soul around. I guess the resort folks were getting ready for dinner or something, but they were missing a truly beautiful Aruban sunset. Nothing like watching that shell-pink creep over the horizon and the starburst of the sun absolutely plummet toward the sea. 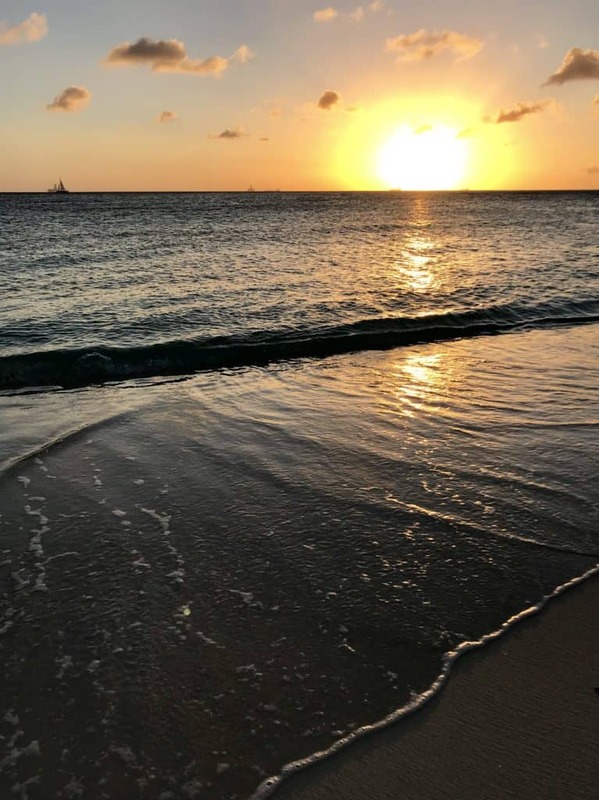 The sun sets so quickly in Aruba that you can literally see it falling. 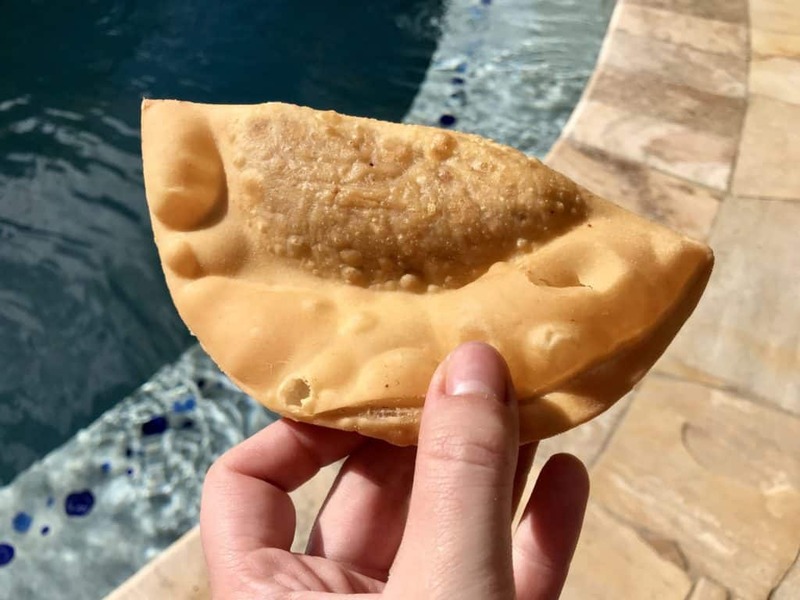 Make sure you get out and try some of the traditional Aruban foods, and get some fresh seafood while you’re at it! Do get up to Palm Beach, just once. Unless you’re a partier or into crowds, in which case it may be your scene. 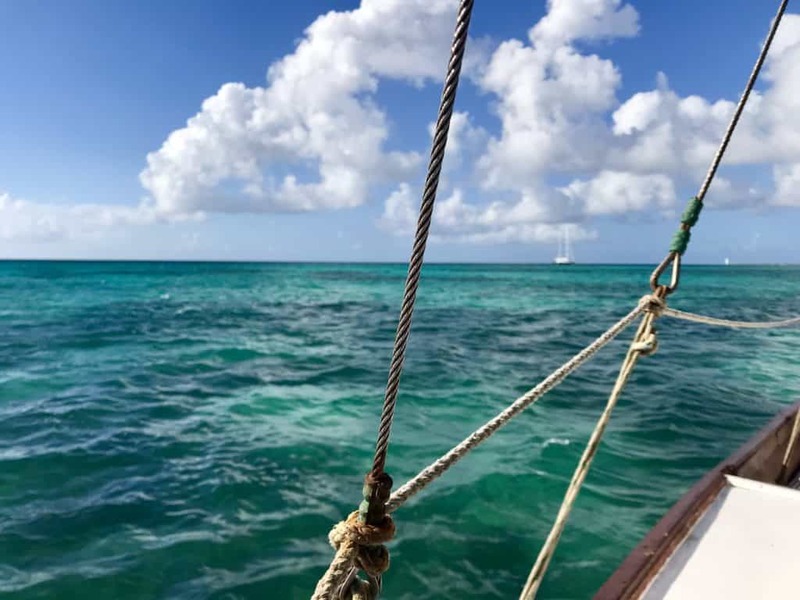 DEFINITELY get out on the water for a sail and snorkel (and sip!). 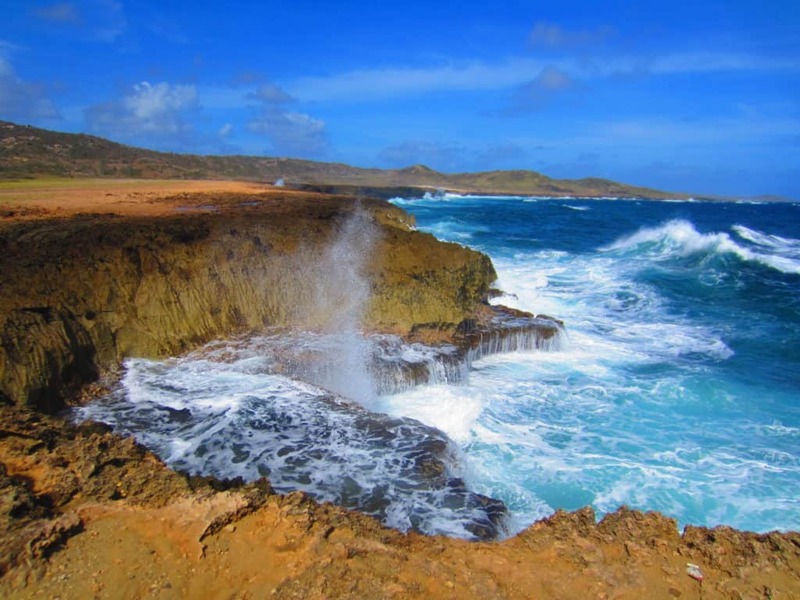 Explore the island’s nature, history, and wilder side through a jeep tour. 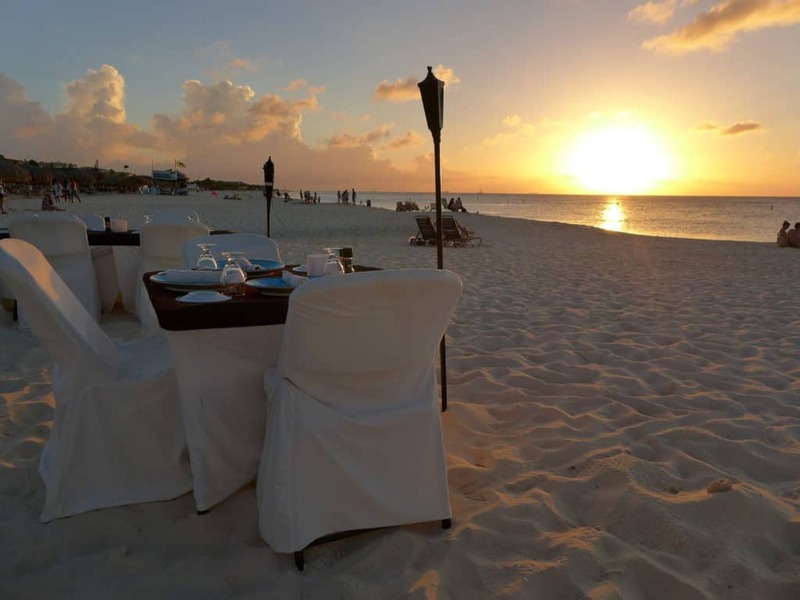 Splurge on a nice dinner with a great view, like right on the sand (Passions on the Beach was awesome!). 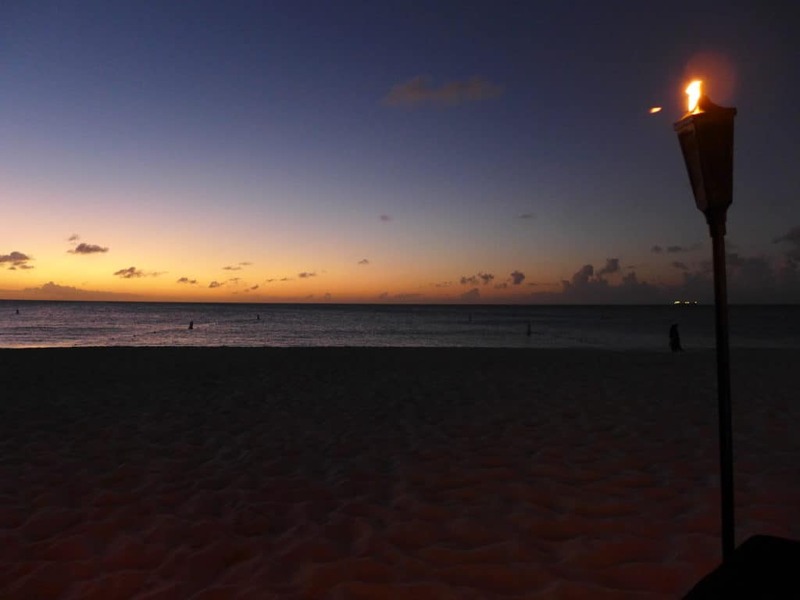 Find yourself a private sunset view somewhere for a peaceful Aruban sunset (again, big fan of Druif Beach). 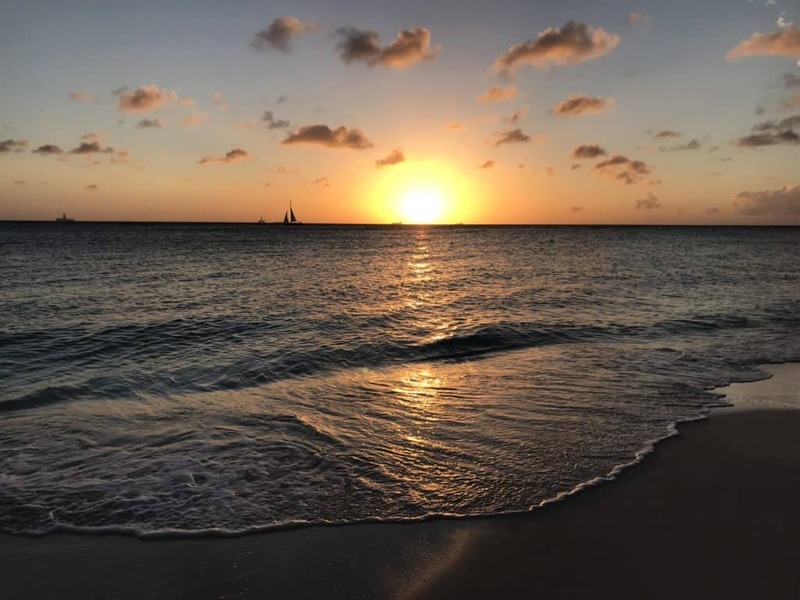 Have you spent time in Aruba? 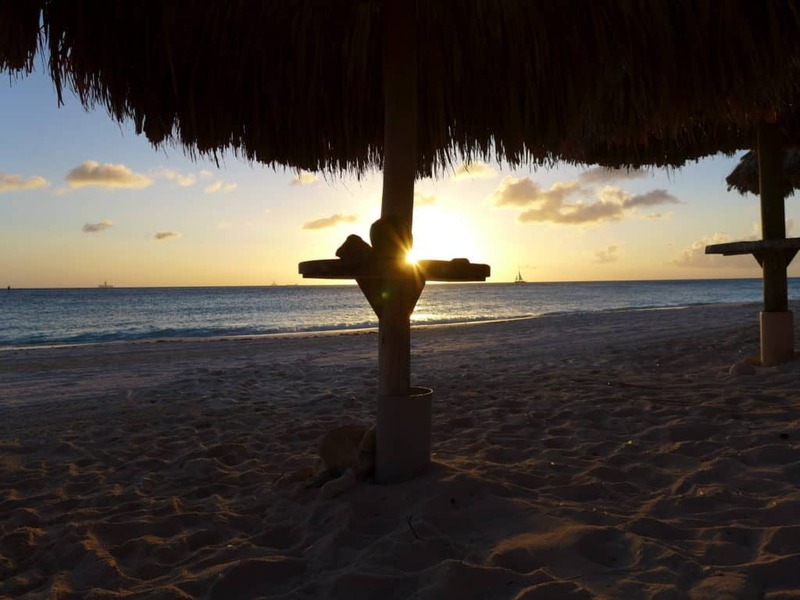 If so, what are some of your other best tips for having a great, chill vacation in Aruba? Would love to hear from you in the comments!